The quest for storage devices that pack more information into a smaller space has reached a new limit, with memory that writes information atom-by-atom. Dutch scientists developed rewritable memory that stores information in the positions of individual chlorine atoms on a copper surface. The information storage density is two to three orders of magnitude beyond current hard disk or flash technology. Details of the advance appear in the journal Nature Nanotechnology. 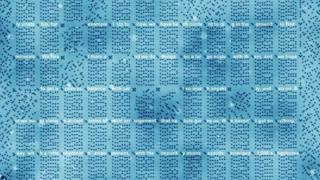 The 1 kilobyte memory is the work of a team led by Sander Otte at the Technical University of Delft (TU Delft). With each bit of data represented by the position of a single chlorine atom, the team was able to reach a density of 500 Terabits per square inch. "In theory, this storage density would allow all books ever created by humans to be written on a single post stamp," said Dr Otte. Or, by another measure, the entire contents of the US Library of Congress could be stored in a 0.1mm-wide cube. The researchers used a scanning tunneling microscope (STM), in which a sharp needle probes the atoms on the surface one by one. This allowed the researchers to push the atoms around in a manner which Sander Otte compares to a sliding puzzle. "Every bit consists of two positions on a surface of copper atoms, and one chlorine atom that we can slide back and forth between these two positions," he said. "If the chlorine atom is in the top position, there is a hole beneath it - we call this a 1. If the hole is in the top position and the chlorine atom is therefore on the bottom, then the bit is a 0." Because the chlorine atoms are surrounded by other chlorine atoms (except near the holes), they keep each other in place. For this reason, the team at TU Delft believe their method is much more stable than methods using loose atoms - and more suitable for practical data storage applications. As a proof of principle, the team encoded a section of a famous lecture called "There's plenty of room at the bottom" by the physicist Richard Feynman on an area 100 nanometres wide. However, despite its future promise, the approach is not ready for the real world just yet. Stable information storage could only be demonstrated at a temperature of 77 Kelvin (-196C) and the speed of single write and read processes is still slow - on the scale of minutes. However, said Dr Otte, "through this achievement we have certainly come a big step closer". In an article published in the same issue of Nature Nanotechnology, Steven Erwin, from the Naval Research Laboratory in Washington DC, acknowledged the current limitations. But he added: "It is important to recognise the significance of this accomplishment — a functioning high density atomic-scale memory device that will, at the very least, stimulate our imaginations towards the next such milestone."